(the phone number can be found under → 'Opening Hours' below). 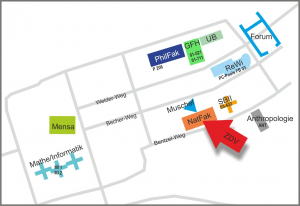 You can enter the Data Center via the main entrance of the natural sciences institute building at 21, Johann-Joachim-Becher-Weg. Mo to Fr: 05:00 until 21:00, Sa: 7:30 until 14:00.